Having come off of some very successful lectures for the New York Cooking School, Parloa in the fall of 1882 decides to open up a cooking school of her own modeled after her Boston school of Cookery. Maria Parloa leased a lovely house at 222 East Seventeenth street, near Stuyvesant square. It had been renovated to fit her school and this became her headquarters for some time. On Monday, October 30, opening day nearly 20 women, both young and old came to Parloa's school to listen to her lecture on the art and science of good cooking. Miss Parloa wore a blue check dress with a neat white apron. The class began exactly at 2:30 p.m. Students copied recipes, instructions and hints. "The School of Cookery is designed to furnish ladies with all the knowledge of kitchen duties which is ordinarily desired, and it will always be conducted with the view of affording every patron a genuine benefit. It is not intented merely to provide and afternoon's diversion for occasional auditors at the public lectures, nor simply to furnish a round of merry times for pupils in practice classes: neither, on the other hand is it intended to permit the studies to become tedious in any degree." The lesson plans were similar to Boston's. She provided demonstrations twice a week or more as needed. When she was not teaching in her school she was lecturing in other cities, working on her books, or donating her time to charities. 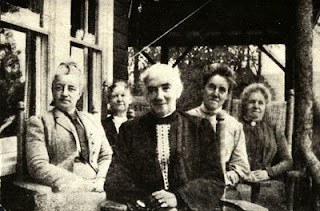 In October, 1877 Maria Parloa opened the doors of her school of cookery. Miss Parloa's School of Cookery was located at 174 Tremont Street in Boston, where today a multiplex Loews Cinema stands. It had been the studio of William M. Hunt, the famous American painter. Hunt was believed to have been the first American master to admit female students into his classes. It is highly likely that Parloa first became acquainted with Mr. Hunt during her days on Appledore Island. "was approached through a pretty reception room and found to be a spacious, inviting apartment, as far different from the ordinary schoolroom as anybody can imagine. Half of the room, intended for the audience, contained tiers of low platforms, neatly carpeted, on which were ranged fifty or more comfortable chairs; the other half was carpeted with oil-cloth, and in this part stood a large stove and several tables. Near by were well-stocked china closets and a refrigerator room. A blue and white tiling, covering the wall space around the stove and above some of the tables; half-a-dozen photographic views of the mountain scenes familiar to Miss Parloa; a few other pictures, of a bright character; and best of all, a mass of plants and vines, partly filling an immense window through which sunlight streamed. These were some of the things that made the place so cherry as to convince all comers that the study of cookery was to be made a real pleasure." 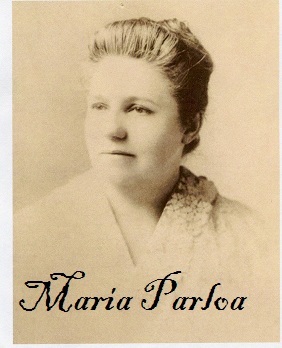 Parloa continued her school in Boston until 1882. In the fall of 1881 Parloa went west to lecture in Chicago, Milwaukee and elsewhere. She then did a stint at the New York Cooking School which was having some difficulties and in need of some new energy. Her lectures were very successful and the auditorium was always filled. In autumn of 1882 she learned that the school was discontinuing outside lectures, so a new school was born in New York.